What is the formula for success at your job? As a spouse? Aparent? A Little League baseball coach or behind the bench of aminor hockey team? What does it take to get ahead? To separate yourself from thecompetition? To lead a less stressful and happier existence? To befulfilled in personal and professional pursuits? What is the most important dynamic of your makeup? Is it your A)intelligence quotient? or B) emotional quotient? If you picked "A", you are partly correct. Your intelligencequotient can be a predictor of things such as academic achievement.But your IQ is fixed and unchangeable. 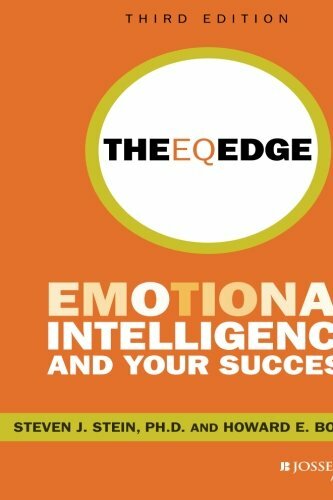 The real key to personal andprofessional growth is your emotional intelligence quotient, whichyou can nurture and develop by learning more about EQ from theinternational bestseller The EQ Edge. Authors Steven J. Stein and Howard E. Book show you how thedynamic of emotional intelligence works. By understanding EQ, youcan build more meaningful relationships, boost your confidence andoptimism, and respond to challenges with enthusiasm-all of whichare essential ingredients of success. The EQ Edge offers fascinating-and sometimessurprising-insights into what it takes to be a top law-enforcementofficer, lawyer, school principal, student, doctor, dentist or CEO.You will learn what the top EQ factors are across many differentkinds of jobs, from business managers and customer servicerepresentatives to HR professionals and public servants. The EQ Edge will help you determine which personnel arethe right fit for job opportunities and who among your staff arethe most promising leaders and drivers of your business. Andbecause all of us have other roles-parent, spouse, caregiver toaging parents, neighbor, friend-The EQ Edge also describeshow everyone can be more successful in these relationships. About: Why do some people possess better emotional well-being than others? About: REVISED AND UPDAT ED WITH NEW RESEARCH INTO EQ AND PERSONAL ANDCAREER SUCCESS What is the formula for success at your job? About: A FULLY REVISED AND UPDATED EDITION OF THE INTERNATIONAL BESTSELLER What does it take to be a firefighter? About: With real-life anecdotes of EI factors interacting at work, home, and in social situations, this book defines EI, demonstrates new evidence on its importance, provides useful steps to improve it, and enables readers to begin the process of change at their own pace.